The fondest memories are made when gathered around the table.' Bring the traditional values back in to your home by eating as a family around the table. 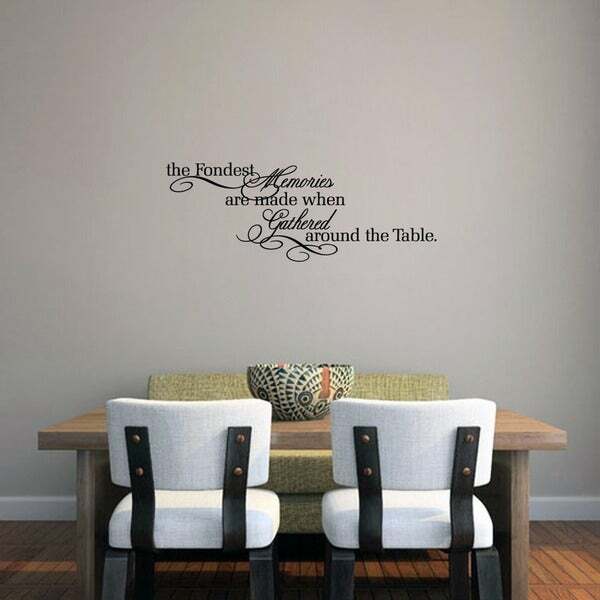 This wall quote will display beautifully as you enjoy your meal together in the dining room. This wall quote is just what I was looking for to go on the wall above my kitchen table. Put this on the wall around our Banquette/dining table with a Watercolor picture inset with it. The script is beautiful. Was easily applied and durable. We have a LARGE family - and have family dinner every other Tuesday. I can't wait to see everyone's reaction at the next dinner! We make new memories every time we are together! Love this on my dining room wall, looks great. Have to take your time when applying it though! Very good quality and looks great on my dining room wall. Just as pictured on-line. Love it and have received a ton of compliments. The wording was very nice and the color is what I wanted but it took me at least 3 weeks to get the letters to stick to the wall and when they finally came off some of the letters where not full letters. I don't recommend this item. This is a certain of conversation when we get together. He brought the whole decorations together. Best piece I ever purchased. I love the expression but I had to return because the size was way too small for the wall in our eating area. Overstock does not sell this in the 30 ×60 size. I had to buy this somewhere else. We ordered this just in time for our holiday Thanksgiving dinner! It was a hit and very easy to install! This is a beautiful saying that I want to be reminder to my family every day. Love this for my kitchen, always sitting around the table with family. Good fit for the space it will be used in and elegant lettering.